The 3008 Cyclone Recirculation System (CRS) is designed to reduce both water use and waste treatment costs. 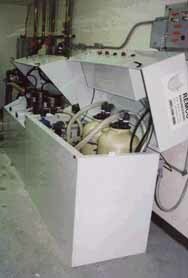 The system gravity feeds water from the user's scrubber into the manufacturers holding tank. A seal-less centrifugal pump accelerates the water through a centrifugal separator, which removes the copper and pumice to a 5 µ level. The separator is dumped once per minute to a bag filter that holds the filtrates. The clarified water is then fed to one of two automatic backwashing media-depth filters, which polish up the effluent for recirculation back to the scrubber. In addition, a level control on the main tank automatically maintains the solution level so that the slight bleed of the filtered water to the drain prevents a buildup of contaminants in the water. Backwash water from the depth filters is moved through the bag filter to remove any sediment and returned to the main holding tank for reprocessing. The system features an operational pH range of 6.5 to 14, a flow rate of 10 to 12 gpm with a single scrubber and 20 gpm in a dual scrubber configuration, and a 1.5-hp pump. In addition, the system features a compact sizing for easy placement, fully automatic controls, and a "flip top box" design for simplified bag filter changing. Available options include rubber coating of pump and cyclone for pumice or aluminum oxide materials, a pH adjust for neutralizing acid predip, board detection at the scrubber for automatic starting of the system, and an open fiberglass skid or polypropylene enclosure. Remco Engineering, 410 Bryant Circle, Ojai, CA 93023. Tel: 805-646-3706. Fax: 805-646-3923.